Frank Fiedler – Mixdown and Moog. Florian Fricke – Fender piano, Moog and organ. Holger Trülzsch – African and Turkish percussion. Bettina Fricke – Cymbals and production. It’s a corollary, logical, step for the venerable Popol Vuh to transmit their hallowed form of sound sculpture from the sacrosanct vestiges of a cathedral. Just like their natural bedfellows, Tangerine Dream, they also performed and recorded in the palatial proscenium piety of the church. Their second tome, In den Gärten Pharaos features an empirical requiem that absorbs the environment and reverberation of Bamberg: this thousand year-old German cathedral (founded in 1004) is the resting place for Pope Clement II, and houses many dubiously adopted (both by zealots, Crusaders and Nazis) iconic stone-crafted figures. Florian Fricke, Frank Fiedler, Holger Trülzsch and Bettina Fricke congregated under God’s roof, with an assemblage of Moog, organ, Fender piano and sostenuto percussion from Africa and Asia. 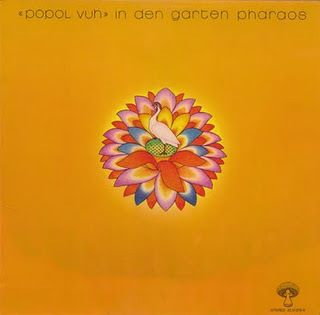 With shimmering cymbal lift-off and ceremonial holy-organ, Popol Vuh explore their surrounding. The template for their future Werner Herzog soundtrack collaborations, are laid down here, as rising seraph choral voices escape from the instruments; and a myriad of strange tones emanate from the various tape-delay interactions: perhaps echoing the lost souls from Bamberg’s Medieval past (the cathedral has succumbed to fire twice, and seen much historical upheaval). Scuttling percussion and pertinacious congas produce a cacophonous rhythmic sprint whilst chimes and hanging pipes are brushed past on the way to the final forlorn motif melody. When the Tangerine Dream played Rheims, the priests were flustered and anguished enough to call for an exorcist! Popol Vuh escaped any such controversy. Following on from the stark ambient serialism of Afftenstunde, the Munich brethren edged closer to the “ecclesiastical” before venturing towards the east. They found a new, but brief, home at the recently spawned German ‘head’ album label Pilz: set up in 1971 by the infamous Ohr label maverick R U Kaiser, its all too fleeting tenure lasted only a couple of years. German for mushroom (we can all guess which particular mushrooms their adhering to), Pilz only released 20 LPs and 7 singles (2 of these were by Popol Vuh): releasing esoteric Tarot card soundtracks, languishing folk rock and cosmic psych, by recondite artists, such as Witthuser & Westrupp. Popol Vuh would perfectly encapsulate the labels mission statement. In den Gärten Pharaos (In the garden of the Pharaoh) features two lengthy wandering compositions; the live recorded B-side ‘Vuh’ which I’ve already mentioned and the 17-minute plus title track. Though the, often, other-worldly sounding suite bears little relation to the myth and mystery of the desert kingdom, or its line of rulers. There is a tenuous progressive chain of musical and sound passages that begins with flowing water: perhaps the title’s ‘garden’ spring or water feature in use. Meditative waves of both Moog orchestrated haunted moods, and oscillating , wavering washes, constantly move in and out of the frame. Those percussive elements simmer and clash as the Fender maps out a brief avant-jazz groove: Miles Davis talks to the Yogi. Still vaporous, free-spirited and roaming undaunted, Popol Vuh’s sound is like an escaping mist. Their next LP, Hosianna Mantra, would be more pastoral and structural; divided into smaller individual tracks. 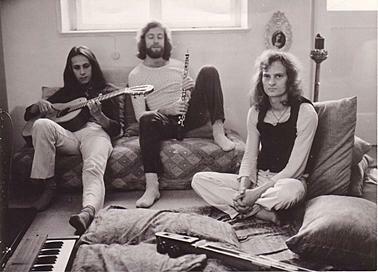 Without the use of Florian’s Moog and electronic components, Popol Vuh became a more traditional and atavistic prospect: influenced heavily by the spiritualism and mystique of India; dominated in sound by the piano, harpsichord and use of multi-layering voices. Both Fiedler and Trülzsch would leave – though they ventured back later – leaving Florian to assemble a Mk II version of the group. A line-up that went on in 1971 to compose the first of their Werner Herzog partnership film scores for ‘Aguirre: Wrath Of God’. Already the seeds of In den Gärten Pharaos can be heard in this particular soundtrack; their long-played out chords, sweeps, holy utterances and misty soundscapes, all on show.